Some people may consider "density" a dirty word, but if designed well, a dense community can feel both spacious and private. 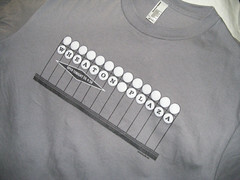 Take Top of the Park, a 1940's-era condominium in Long Branch. 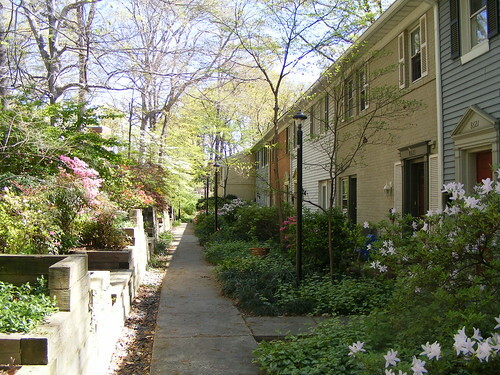 While none of the townhouses have their own yards, they share a backyard that anyone would be envious of. Typical townhouses in Top of the Park. Top of the Park was built in 1942 as apartments and converted to condominiums in the 1970's. It's a product of the Garden City movement, which took hold at the turn of the 20th century as an attempt to synthesize the best features of the city and country, giving residents access to urban amenities in a more natural setting. Garden City ideas were very popular in the design of European neighborhoods, but they appeared in American communities as well, like Radburn, New Jersey and nearby Greenbelt. 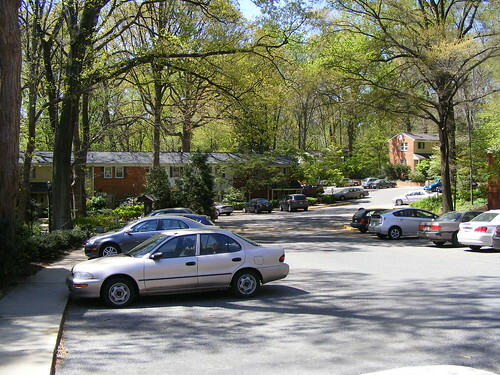 Though it was built on what was once the suburban edge, Top of the Park can arguably be called an urban neighborhood now, surrounded by taller buildings and within a short walk of the Long Branch shopping district. One day, it will be a few blocks from two Purple Line stations. Parking is organized along a few dead-end streets. Nonetheless, the community still retains a country feel. In keeping with the Garden City ideal of separating car and pedestrian traffic, Top of the Park is organized around a few dead-end streets where residents park their cars, then walk through shared courtyards to their homes, which face common footpaths. A built-in bench along a walkway. The walk from the car to the house can be a little long, but it might be worth it. The paths are lined with beautiful flowers and bushes, and everywhere you look are views of mature trees. Little touches like these built-in benches make the walkways a place for spending time in, not just passing through. The original designers also took advantage of the site's hilly terrain. The two rows of houses pictured above can't be more than 50 feet apart, but placing one of them at a higher elevation ensures that they don't look directly into each other, giving residents more privacy. Since it's a condominium, Top of the Park residents own their homes, but not the land they sit on. However, they are allowed to make some alterations to the front and back of their units, like this porch. This policy gives residents the ability to individualize their homes, but at a lower cost than if they bought a conventional townhouse or detached house with a private yard. 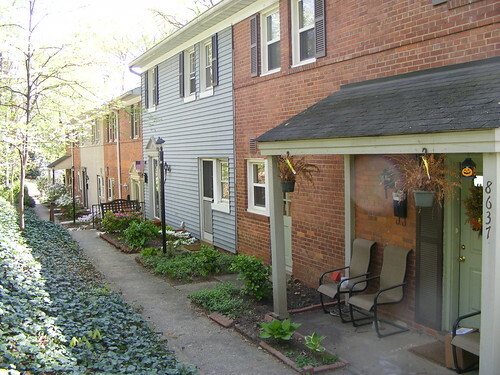 Besides, residents get to enjoy these shared courtyards, filled with trees, flowers and some outdoor furniture. When I visited a few months ago, I heard birds singing as neighbors tended their gardens and kids ran around. 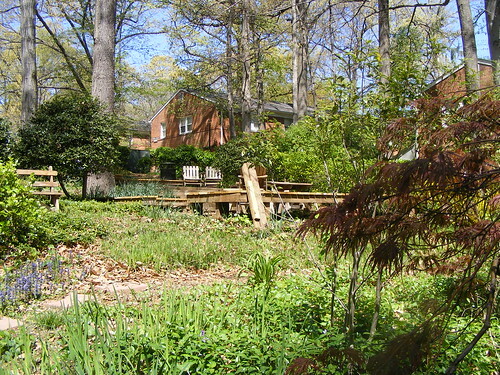 I imagine it would be very difficult, or at least very expensive, to find a private yard this nice this close to downtown Silver Spring. 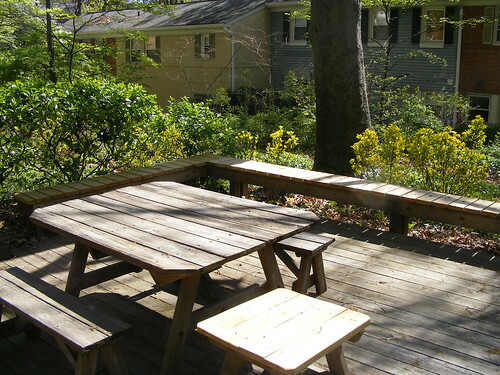 Picnic table and benches in a courtyard. These terraces seem to lend themselves well to neighborly gatherings, like a picnic or cookout. I noticed that in addition to providing shade, the trees screen views of the surrounding houses, giving them privacy. 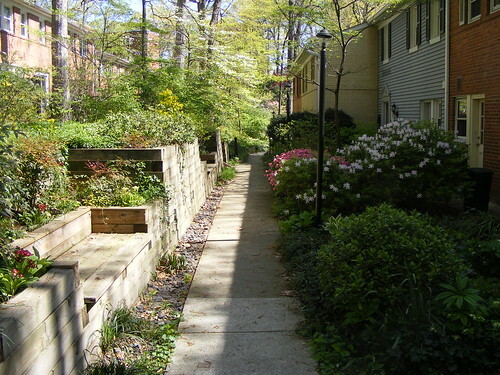 A walkway lined with tall trees and landscaping. With 166 homes on 15 acres, Top of the Park wouldn't be mistaken for Manhattan, but it's part of one of Montgomery County's densest neighborhoods. It's also about as dense as some recently-built or proposed townhouse developments around Silver Spring. Unlike those neighborhoods, however, Top of the Park has had decades to let its trees grow to the point where you can barely see the houses between them in an aerial photo. Hopefully, the same thing will happen in newer projects. Top of the Park may be 70 years old, but it shows that we can still offer privacy, ample open space and opportunities for personal expression to families who may not want or can't afford a large, detached house. It's a useful example for Montgomery County as it tries to accommodate a growing population in an increasingly limited space. Thank you, Dan, for a wonderful piece on one of this area's best-kept secrets. My family and I have lived in the TOP for about four years, and we love it -- the trees are magnificent, there's a woodpecker who hangs out just above our porch, and deer amble around the walkways. 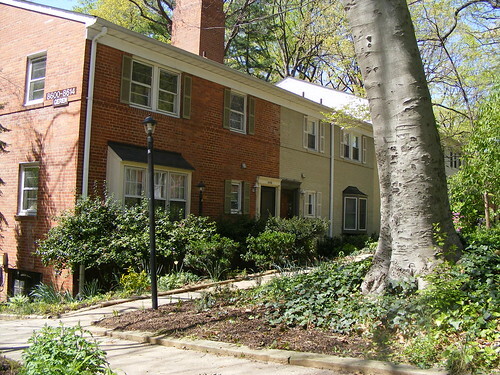 Plus, we're just up the hill from Sligo Creek. The best part, though, is the community. It's a nice mix of generations and backgrounds, and there are probably two dozen kids under age 10 running around. It is interesting to note that this "density done right" is less dense, at just over 11 homes per acre, than the recently approved townhouse development at the Chelsea School site. Maybe the people claiming it was too dense were right after all. 63 homes at Chelsea Court/5 acres = 12.6 homes/acre. Is that such a big difference? I don't know. 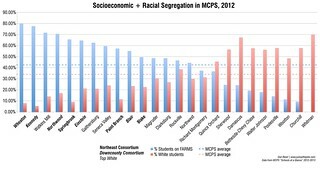 I'd argue that it's just one factor in what makes the quality of a place, though all too often we focus on that alone.